In Chicagoland, inclement weather is a certainty. Not only is it rainy and windy on a regular basis, but, come wintertime, it snows like crazy. Unfortunately, all of this inclement weather can have a major negative effect on your front door. Fortunately, there is something you can do to protect your front door: you can install a storm door. Aspen Exterior Company has been installing storm doors for over 40 years, helping to protect thousands of front doors throughout the Chicagoland area. Offering a huge selection of storm doors from our storm door supplier, ProVia, we are sure to have something which suits your preferences. Schedule an appointment with Aspen today! 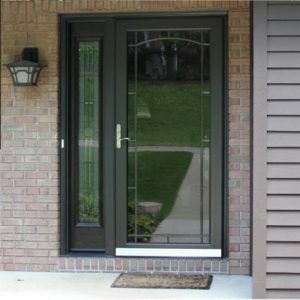 The primary purpose of storm doors is to protect front doors from weather damage. However, there is much more to storm doors than just this. Storm doors serve many purposes, ultimately improving the overall functionality of your home. Rain, sleet, snow, and Chicagoland all go hand-in-hand. Unfortunately, nothing causes damage to a front door quicker than moisture. This is where storm doors come in handy. By installing a storm door in front of your front door, you protect your front door from all forms of environmental moisture damage. With a storm door installed, you won’t have to worry about rotting, warping, discoloration, or any other type of front door damage. It’s not only inclimate weather that can cause damage to a front door. In fact, when it comes to wood front doors, insects are a big problem. These pesky parasites will latch onto your front door, slowly gnawing it away until it looks decayed. Installing a storm door will prevent these parasitic insects from making their way to your front door. You won’t have to worry about your front door slowly withering away. While modern front doors tend to provide ample insulation, they could always use a little help. Modern storm doors are designed with insulation as a priority, built to seal out both heat and cold from your home. If you want to use less gas and electricity, and if you want save money on your energy bills, a storm door would be a wise investment. Aspen can handle the installation for you! Modern front doors and locks are very secure. However, this doesn’t mean that they couldn’t benefit from a bit of extra security. 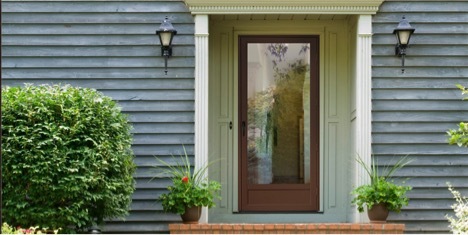 Storm doors provide an extra layer of security to any home upon which they’re installed. Short of being smashed to pieces, they are present one more lawyer of protection for you and your family. Aspen Exterior has all of its storm doors supplied by ProVia, a company with a seemingly endless selection of storm doors. Offering a number of different door styles in a number of different colors, ProVia almost certainly has a storm door that strikes your fancy. Sporting high-quality glass, and manufactured with top-of-the-line stainless steel, these doors are as good as storm doors get. We here at Aspen Exterior Company are no strangers to storm door installations. Over the years, we have installed a countless number of storm doors on Chicagoland homes. If you’re seeking storm door installation in Chicagoland, we’re the people to call. Our team of experienced, friendly, and skilled door installation experts offers fully guaranteed service. All of our door installations are backed by 10-year labor warranties, ensuring that you get what you pay for. Discuss your storm door needs by contacting Aspen at (847) 590-5600!